One of the most loved stories from the Old Testament is the story of Daniel in the Lion’s Den. The whole story of Daniel starts when he was just a young boy. However, by the time Daniel was cast into the lion’s den he was an old man. Many things happened in Daniel’s life, but he continued to trust and serve God even though he was forced to work for wicked people. The main part of the story is in Daniel 6. But you can read the first 5 chapters of the book of Daniel to read about everything that happened to him. There may be times in your life when people try to get you to disobey God. You should take encouragement from the story of Daniel and trust God to take care of you. Daniel was a little boy when the Babylonian army came to fight Israel. God allowed some of the people of Israel to be carried off as slaves. Daniel and three of his friends Hananiah, Mishael, and Azariah were taken. They were very smart. The king of Babylon, Nebuchadnezzar, wanted them to work for him because they were so smart. The four boys made it clear to the king that they would obey God first of all. Even though they were in prison and were probably just little children (maybe 8 to 12 years old) they only ate food that God said was clean. They knew God’s laws and wanted to please Him. To the surprise of everyone around them they were stronger and healthier than the other prisoners who ate the king’s food. Maybe you know Daniel’s three friends by different names. They are Shadrach, Meshach, and Abednego. These are the three who were put into a fiery furnace because they would not bow down to the idol that King Nebuchadnezzar made. Daniel’s friends wanted to obey God as much as Daniel did and they trusted God to save them. And He did! We don’t know why Daniel was not put into the furnace. The Bible does not even mention he was there when the people were supposed to worship the idol. We know that Daniel and his friends were adults by this time and they were also important men in the government. Maybe Daniel had been sent to another city to work during that time. After Shadrach, Meshach and Abednego got out of the furnace the king began to worship God. Eventually he turned away from God again and another king took his place. Daniel and his friends worked for the new government until they were old men. Even though there was a new king, Daniel was still an important person in the government. Daniel also had enemies. His enemies were men who were jealous of Daniel’s wisdom and power. The new king, Darius, really liked Daniel. Though he did not always agree with Daniel and his God, Darius allowed Daniel to worship God as he pleased. Daniel’s enemies thought up a plan to get rid of Daniel. They could not find anything that Daniel did that was wrong. He never broke any laws. They decided to make a new law that they knew he could not obey. But first they needed to convince the king to sign the new law. They went to King Darius and talked very nicely to him. Then they proposed a new law that said people could only pray to or ask things from the king for 30 days. If the king would sign the new law, then they would make sure that people obeyed it. King Darius thought this was a good idea. He wanted the people in the kingdom to worship and obey him. He agreed to the new law and signed the papers. Whoever broke the new law would be punished by being thrown into a lion’s den. This was a cave in the ground where lions were trapped. Maybe it was a normal type punishment for people who broke really important laws there. Certainly anyone put into a cave full of lions would not live very long. Daniel knew about the new law, but he continued to pray to God. The Bible says that he went to his window three times every day to pray. He opened the window and knelt down before the Lord. This was not something he did just so he could break the new law. He prayed like this all the time and his enemies knew it. They were waiting for him to open his windows and worship God. After the law was signed they could arrest Daniel and take him to the king to be punished. Though King Darius never intended for Daniel to stop worshiping his God, the king was bound to obey the law he signed. 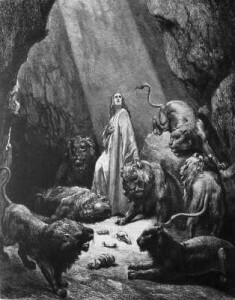 Daniel was thrown into the den of lions while the king worried for his well-being. The Bible says that the king did not hardly sleep that night. He was troubled with what would happen to Daniel. The Bible tells us that Daniel was not harmed by the lions at all. Their mouths were shut and they did not scratch or tear Daniel. When the king came to see Daniel the next morning he was relieved to know that Daniel was still alive. He helped Daniel climb out of the pit. King Darius then ordered the men (and their families) who made the wicked law to be thrown in with the lions. The Bible says that they had not even touched the ground by the time the lions tore them and began to eating them. The lions didn’t leave Daniel alone because they were not hungry, they left him alone because God refused to let them eat him. There may be times in your life when people try to get you to disobey God. You should take encouragement from the story of Daniel and trust God to take care of you. Daniel didn’t know what would happen to him in the lion’s den. He only trusted that God would take care of him and God did. You and I can trust God too. I did take encouragement from this my brother…truly, we all have our own lion’s den from time to time and to remember Daniel’s faithfulness and trust is a good reminder that God shows Himself strong when we are weak. Well done. I am always reminded of my students when I think of the story of Daniel and the Lion’s den. It was a great Bible story to play act in school! Thanks for this David, well done. One of the problems I have in my Christian walk is with lying. Sometimes I am tempted to tell a white lie to get out of a difficult situation. But this story about Daniel in the lion’s den reminds me that if I trust and obey God, God will protect me and rescue me from the difficult circumstance. Thanks for sharing the great story! Previous post: Does The Quran Mention Jesus? What Do Muslims Believe About Jesus? Next post: If God is Love, What is Satan?